It is not often that you manage to see your target species when you go on a walk. Well, I was in that happy position today. We set off for the section of the Gaywood River which runs through The Walks park in King’s Lynn town centre, with one aim being to find banded demoiselles, a species of large damselfly. I had seen them there a few years ago and was reminded of them during my visit to the Mars UK site last week. To start with, there was no sign of the demoiselles. We walked alongside the river, peering at the nettles and other wild plants along its edge in case one was perched there. We saw bees and a red admiral which looked as if it had been in the wars and seemed rather shaky. Then, my husband thought he had seen a vivid blue butterfly. Joining him, I caught sight of a whisper of bright blue as the insect flashed out of sight behind the expanse of greenery at the edge of the river. It did give the impression that it might be a butterfly, but also made me think I may have found my target, so I watched for it to come back again. Moments passed, then something flew around and settled on a leaf: a greeny, gold damselfly, which I felt had to be the female of the species. I got one or two photos of her. Eventually, the blue flash returned. There were two of them, briefly. They do seem butterfly-like in flight, the band of blue on their wings and the metallic blue-green body catches the light and makes their wings seem floppier and bigger than they are. One of the males disappeared. Whereas the female kept reasonably still, the male kept flying up – catching food I suppose. But at least he, too, did come back to a perch to give me a chance to see him and photograph him, whereas the big hawker dragonflies just keep going and male it very difficult for you to identify them! I managed to get a reasonable picture of the female, but the one of the male was blurry, although you can make out the distinguishing feature of the blue band on the wings. I decided to include both so you can get an idea of what they look like. Next time I’ll take a more powerful lens! My second target for the visit was much simpler to see, being a giant sequoia tree. Actually, this particular sequoia has got a lot of growing to do – it’s probably around 12 feet tall I guesss, at the moment. I wanted to get a photo of myself beside it so I could guage the height, and I’d like to repeat the process every now and again to keep track of its growth. 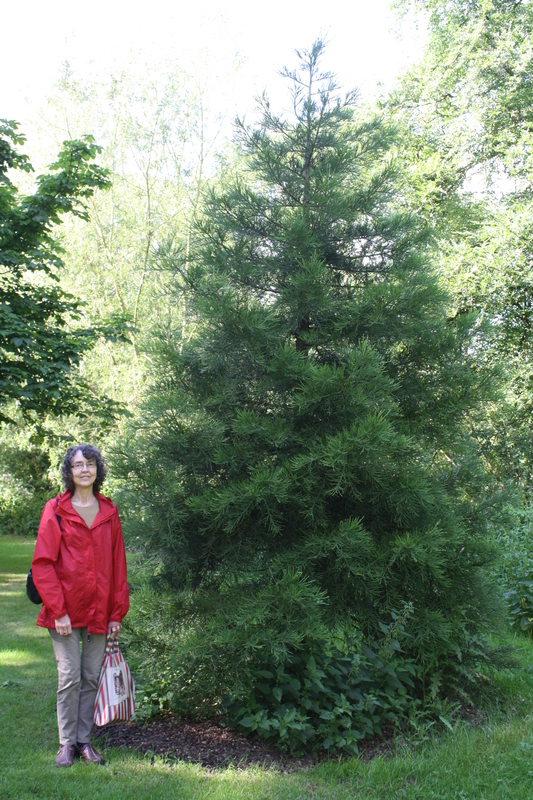 The sequoia is one of the 31 trees in the park that the King’s Lynn and West Norfolk Borough Council have included in an enjoyable trail. It’s well worth attempting and there is a booklet with brief details of each tree to accompany it. Me with the baby giant sequoia. Later, I saw a small bird flying quite low in front of us and going up and down in a series of waves. I wondered if it might be a pied wagtail and borrowed my husband’s binoculars and discovered it was. It came back to the grass and wandered about looking for food. It’s the first pied wagtail I’ve seen for about three months – the last time was in the evening in the town centre. That time, it kept flying from the top of the roof of a bank into the middle of the street, catching insects in the air and then flying back to its rooftop perch. It kept calling “chis-zick”. I think we saw another red admiral in flight near some wild flowers. There are so few butterflies about at the moment, largely due to the weather we’ve had, I suppose. Hopefully, the situation will improve soon. 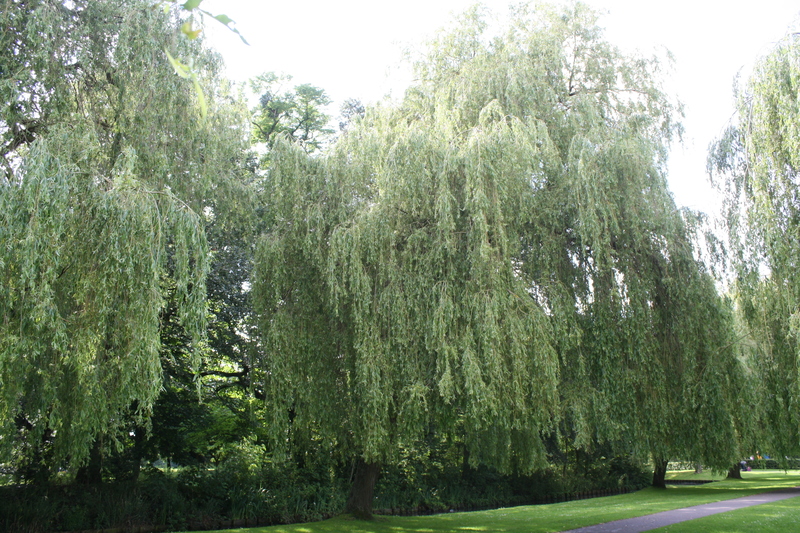 Some of the many weeping willow trees in The Walks. There are quite a few areas in this 42-acre park which have been left to grow wild, which is encouraging. It’s a good mix on the whole and there are plenty of trees, of a range of types – a green lung for the town. The Walks was begun in the 18th century and in 1998 was designated by English Heritage as a grade II historic park. Its always satisfying when you find the species you’re after.